I was told the CWU would be demo-ing outside the High Court's Rolls Building in support of the JFSA and claimant Subpostmasters from 9.30am. What I didn't realise is that they'd be done by 10am. I rocked up (phrase of the day - see below) at 10.05am to find a few CWU members lurking outside, but no placards. Thankfully, efficient people took photographs and forwarded them on. There was a definite buzz around, both inside and outside the Rolls Building. Court 26 was the fullest I've seen it. At least a dozen claimants were in attendance, including Seema Misra, Jo Hamilton, Sue Knight, Lee Castleton and Pam Stubbs. 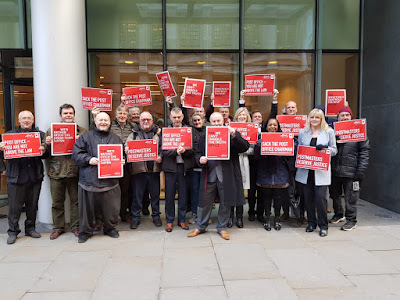 Ron Warmington from Second Sight was also there, as were many of the CWU reps who had been stationed outside early doors (including National Organiser Andy Furey and Postmaster Mark Baker - the latter singled out by the judge in the Common Issues trial judgment for his "redoubtable" Freedom of Information campaigning). On the hack front, Karl Flinders from Computer Weekly put in a shift, as did Jane Croft from the Financial Times. It was great to see Joshua Rozenburg wander in, too. He is a legend in legal journalism and I remember watching him on telly as a kid. When he came over to say hello I didn't tell him that, but I wanted to. The court was so full a couple of claimant supporters arrived late and saw the only chairs available were on the solicitors' benches. Not knowing any better they plonked themselves down and became the only members of the public to have their own personal court documentation screen. The solicitors were either too polite or worried about disrupting proceedings to tell the visitors to push off, so they stayed there. After lunch the same supporters came back and sat in exactly the same spot without anyone batting an eyelid. So what did everyone witness today? Why were we there? It is possible to ask a judge to recuse (sack) him or herself of grounds of apparent or actual bias. 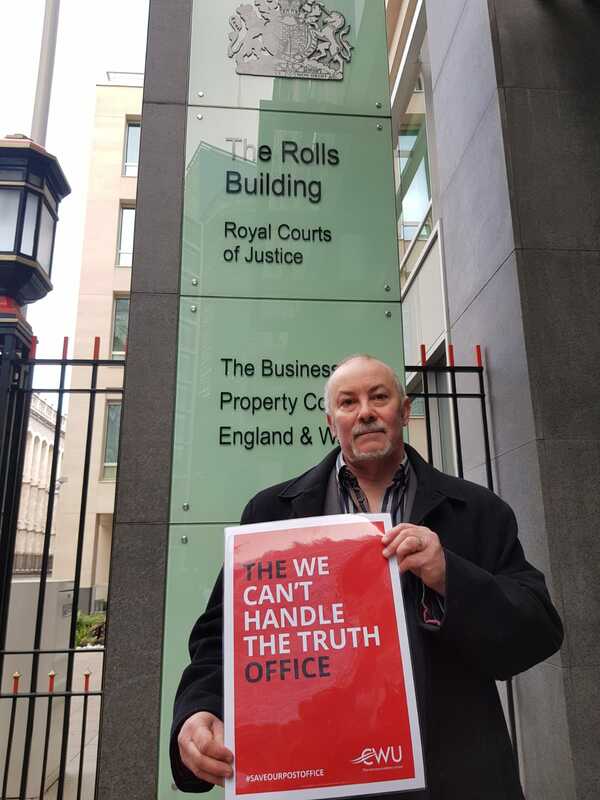 The Post Office believes that J Fraser, in his Common Issues trial judgment has displayed apparent bias against the Post Office. It is an objective test. A recusal application will succeed "if a fair-minded and informed observer, having considered the facts, would conclude that there was a real possibility that the judge was biased"
The "fair-minded and informed observer" took on almost mythical proportions as the day progressed. It is s/he who will tell the judge if he is biased. Unfortunately s/he doesn't exist. It was a day of two halves, Brian. In the morning, Lord Grabiner QC for the Post Office took the judge to pieces by isolating specific parts of his judgment and pointing out that any reasonable person could not impute anything other than apparent bias. In the afternoon, Patrick Green QC for the claimants built the context around those specific parts of J Fraser's judgment and argued his comments were entirely justified. In fact you could almost draw parallels with the Brexit situation. Post Office: How could we possibly lose? You've done it all wrong! Claimants: You lost. Get over it. 1. 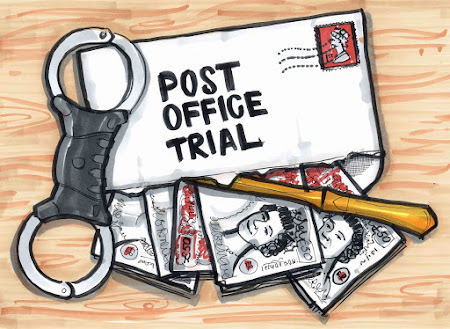 The Post Office will appeal the common issues trial judgment. 2. The decision to apply for the recusal was made at Post Office board level. 3. The judge has reserved his decision on recusal until Tuesday 9 April at 2pm at the earliest. 4. If the recusal is successful the Post Office wants the Horizon trial to be stayed and restarted. Bearing in mind we are three years and £20m into this litigation, if the Post Office is successful, we will almost be back where we started. Which is, of course, exactly what the Post Office wants - a big reset to regain the initiative, and a ramping up of the costs to make everything as expensive as possible. That way the claimants will hopefully run out of money and throw in the towel. In litigation, no one said you had to play nice. To be fair, the Post Office is bossing things right now. It has successfully seized the initiative from the claimants after the Common Issues trial judgment. Anyone who reads even a few hundred words of that judgment can see the pasting the Post Office got. 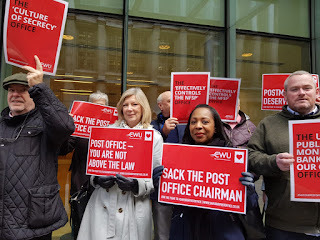 Factually, legally, reputationally and culturally the Post Office was massively exposed by the judge's findings. For an organisation which is obsessed with its public image and shrouded by a cult of "excessive secrecy", this must have been a shock. 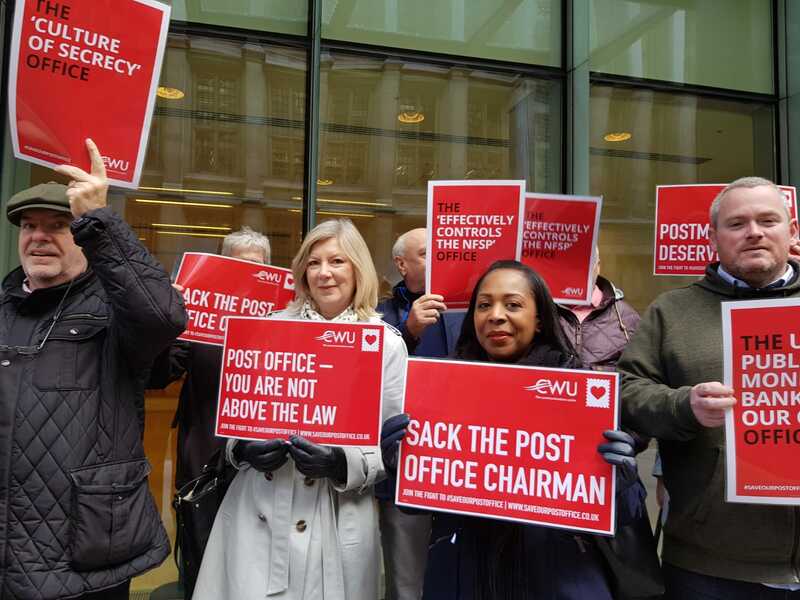 On 15 March, when the judgment was handed down, the Post Office was not just on the ropes, it was floored. Yet within a week it was back. Off the canvas and swinging like a champion. A recusal application is still a massive call, though. To switch metaphors, aiming to sack a senior judge because you don't like some of the things he's said is the legal equivalent of going all in on a pair of tens. You have to be feeling lucky. But as every gambler knows, it isn't just about the cards, it's about the player. On the evidence of today, m'learned friend could stroll into any long-running, hotly-contested™ litigation and own it. He has a presence and charisma which might persuade a casual observer that everything which happened in the litigation before he got involved didn't really matter. This is a man who presumably doesn't take instruction unless he is being paid several thousand pounds an hour, or knows he's going to win. Or both. wasn't necessary for the purposes of the Common Issues. viewed by an objective observer." "Well, I mean, your Lordship can imagine what I would be saying about that, but my submission is that the passage speaks for itself. It was quite something to behold. 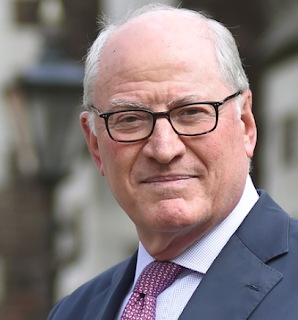 J Fraser would mention that Lord Grabiner had omitted his qualifying statements and caveats and Lord Grabiner would acknowledge this, but add he was coming to it later. ahead and made those findings." You can read the transcript here and my unrolled live tweets here. It must be hard to hear one's professional integrity being taken apart in such an eloquent and public way. But the judge took it on the chin. And after lunch, he turned to Patrick Green QC for the claimants. specifically on a misapprehension as to the proper judicial assessment of the proceedings." having regard to the judgment as a whole." observer knows about the trial as it was presented to your Lordship. about the trial. So "informed" I would underline in relation to the approach of the informed observer test. And he was off. The main two points he made were that the Post Office was not once saying that any of the judge's findings were wrong, just that they were irrelevant. His second point was that in the context of the trial, the proceedings preceding the trial and litigation as a whole... actually they really were very relevant. 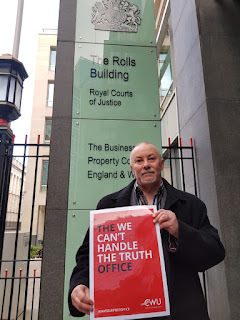 Mr Green said in the context of someone who has been through all the pre-trial shenanigans, and the framing of the way proceedings happened, the judge was justified in what he wrote in his the Common Issues trial judgment. Yet according to Mr Green, the judge was not just expected to take into account what was happening in his courtroom, he was, by case law, required to make findings on it. MR JUSTICE FRASER: I am not sure "rocking up" is right. MR GREEN: I might have put that a bit lightly. seriousness. Evidence-in-chief was given orally. in advance of arriving at court and listening to what they were going to say." "They have adopted internally inconsistent positions in relation to the relevance of evidence and essentially tried to ride two horses going off in completely different directions, and your Lordship has had to try and manage the consequence of that, and clarify it, where possible, on credibility, still leaving an extremely unsatisfactory position, make findings in the light of the litigation as it was presented before court, and then be accused of apparent bias for having done so." I have spoken to a number of senior people since the hearing finished, some of whom were legally qualified. They broadly agreed there is a minuscule chance the judge will recuse himself and an even smaller chance the Court of Appeal will make the decision for him. I'm not so sure. Grabiner was good.